Construction crews continue to create drilled piers for the Parking Garage Expansion project. A third drill rig was brought on site late last week. So far, crews have completed five of the 40 drilled piers for the project. Because each pier requires several loads of concrete, flagmen will be on Garden Avenue to direct traffic and monitor traffic safety. Excavation for the underground storm water detention basin at the expansion site has begun. It is located in the far northeast corner. The basin will be delivered to the site next week. Seed and straw was spread around the bookstore area Thursday. That material will remain in place to control mud and dust until new sod can be installed in the spring. It will allow the inspection and testing of the critical B.E. material interfaces, air and vapor barrier, and fenestrations to make sure there are no constructability deficiencies or water and air infiltration issues prior to the construction of the ISB’s B.E. systems. A third-party testing laboratory will visit the ISB job site and test the B.E. mockup. This process will help determine if modifications are needed before the full building is completed. It will allow the architects to visually inspect the aesthetic qualities of the B.E. materials and make sure they comply with the basis of design and construction documents. It will be used as an education tool for on-site tradesmen so they have a reference for how the B.E. systems must be constructed. 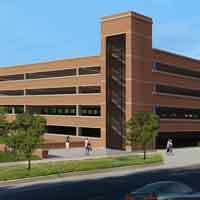 Starting Sept. 28 and lasting through Nov. 3, mechanical, electrical, and plumbing rough-in will occur at slab-on metal decking at Levels 2 thru 4. The Level 0 slab-on-grade concrete preparation and pour will happen Sept. 26 and Sept. 27.